"…the smooth, vocal velvet of Dolukhanova’s tones and supreme technical mastery encapsulated even greater versatility combined with a rare ability to empathize with her audience….Few recitalists in my lifetime possessed her ability to mesmerize listeners into feeling they were the sole recipients of her song. That gift made her one of the most beloved of all Soviet singers, so that in her regular 1940's broadcasts on Russian radio she was able to introduce and popularize numerous new works by young composers – many of whom wrote music especially for her." “Zara Dolukhanova is often cited as the greatest Soviet mezzo-soprano of her time. Her powerful, flexible voice was usually categorized as a coloratura mezzo, but her vocal range also allowed her to sing convincingly as an alto. Dolukhanova was as much a star in the Soviet Union in the mid-20th century as Callas and Tebaldi were in the West. She commanded a huge repertory inclusive of works ranging from J.S. Bach, Handel, and Vivaldi to Mozart, Rossini and Tchaikovsky and on to Prokofiev, Shostakovich, and Khachaturian. She sang folk and traditional songs as well, and was best known on the operatic stage for her Rossini, particularly as Angelina in LA CENERENTOLA and Isabella in L'ITALIANA IN ALGERI. 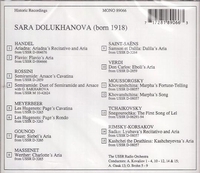 But Dolukhanova is also remembered as a recitalist, earning herself the reputation as one of the world's greatest interpreters of art songs, becoming a sort of female counterpart to Fischer-Dieskau. She débuted in 1938 as Siébel in Gounod's FAUST at the Yerevan Opera in Armenia. After spending three years at the Yerevan Opera, Dolukhanova married composer Alexander Dolukhanian and thereafter performed under her married name. From 1944, she sang as a soloist for Moscow Radio. In the postwar years she gradually built her career in opera, concert, and recital fare. In 1959 she became a regular soloist with the Moscow Philharmonic Orchestra. She toured Europe and the Americas, making her U.S. début in 1959 at Carnegie Hall, drawing scores of rave reviews. "[Dolukhanova’s] mezzo-soprano voice had a beautiful and characteristic timbre and a large range (two and half octaves), a rare combination for such a voice. Particularly impressive was her low register, full-throated, velvety, combined with light, bright coloratura. She had inspiration, intelligence, high musical culture, meticulous taste, poise and nobility in expression of feelings and precision of intonation, not to mention an elegant and attractive stage presence."